Like after a touchdown at a football game, the crowd cheered. You could hear the applause and the hoots and hollers from across the vineyard. I added my voice with a full out scream. Woo HOOOOO! We were cheering the fact that, after an hour of watching the sun being slowly devoured, bite by bite, the moon had just silently slipped into place and completely blocked the sun. We were at a winery in South Carolina, staying overnight night in our Roadtrek camper van. We found the location by researching on Harvest Hosts a couple of months before. 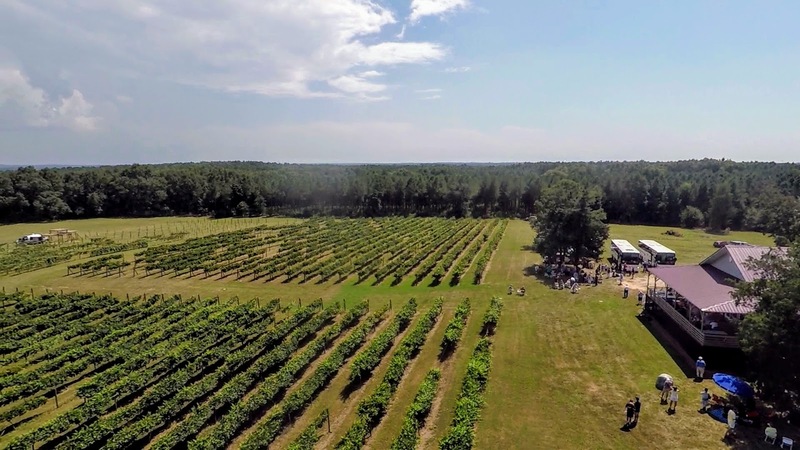 The winery scheduled an event for the eclipse and they were limiting attendance to 300 people. We were the only rv there! We stayed two nights, one before and one after the eclipse. What a treat. We drove a record 600 miles on order to arrive the night before. News stories of traffic jams in the vicinity of the eclipse had us worried. We were at the Jersey shore for a close friend's birthday party on saturday night. As soon as we had a slice of cake, we made our hasty good-bye and hit the road. Mike Wendland, from Roadtreking.com created a one hour video all about the RVers who traveled to view the eclipse. He called it the Biggest RV Travel Weekend ever. If you follow the link and watch the video, you'll see that he starts by interviewing me about my past Eclipse experiences. My mom was an eclipse chaser. I went with her to see two of them. The first was in the Atacama desert of Chile in November of 1994, the second was in Turkey in 1999. Both times, I cried at the point of totality. There is something primal and disturbing about the world going silently dark in the middle of the afternoon, no matter how much you understand what is happening. It has to be experienced. It's so hard to describe the power of that experience. This TED talk does it well. So this eclipse at the winery in South Carolina had big shoes to fill. And fill them it did! Here is an aerial shot of the winery taken with Jim's drone - the eclipse party was by the tasting room at the right. YOu have to look closely at the far left to see our RV. Well - it did feel like a spacecraft-worthy event! Does that mean our RV is actually a Shuttlecraft? How did we get that cool artwork? Oh .. My .. God. It was perfect. The stars came out. The clouds stayed clear. The corona was wispy strands of silk. The diamond ring blazed brightly coming out the other side. And, yes, I cried.